Barack and Michelle Obama are the most admired man and woman in Singapore, according to a study by British-based independent research firm YouGov. The study, which polled more than 37,000 people in 35 countries, was released on Wednesday (April 11). 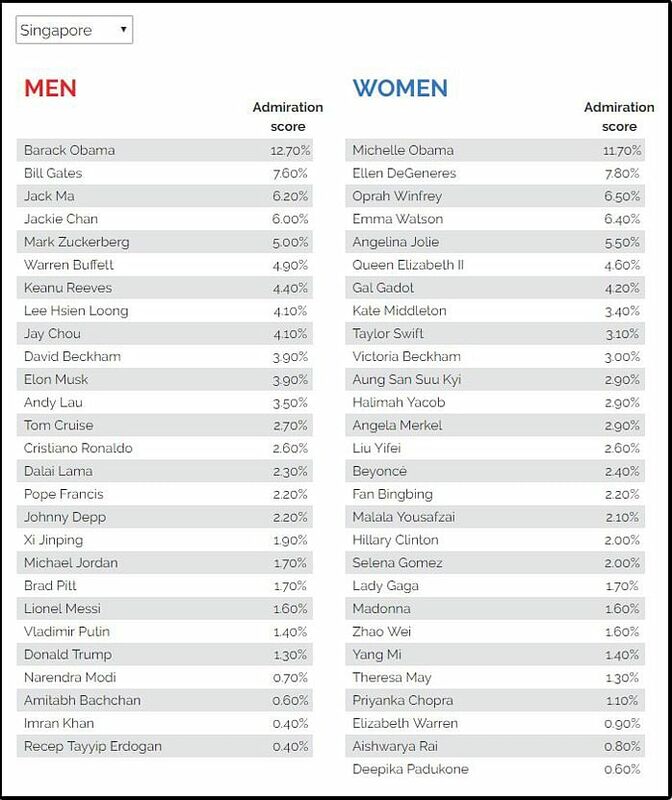 According to the poll, the top 10 admired men in Singapore are: Barack Obama (12.70 per cent), Bill Gates (7.6 per cent), Jack Ma (6.20 per cent), Jackie Chan (6 per cent), Mark Zuckerberg (5 per cent), Warren Buffett (4.90 per cent), Keanu Reeves (4.40 per cent), Lee Hsien Loong (4.10 per cent), Jay Chou (4.10 per cent) and David Beckham (3.90 per cent). The top 10 women admired in Singapore are: Michelle Obama (11.70 per cent), Ellen DeGeneres (7.80 per cent), Oprah Winfrey (6.50 per cent), Emma Watson (6.40 per cent), Angelina Jolie (5.50 per cent), Queen Elizabeth II (4.60 per cent), Gal Gadot (4.20 per cent), Kate Middleton (3.40 per cent), Taylor Swift (3.10 per cent) and Victoria Beckham (3.00 per cent). United States President Donald Trump ranked 16th in Singapore and 17th worldwide. The global poll placed Bill Gates as most admired man, and Angelina Jolie as his female counterpart. The Obamas came in second respectively, while Jackie Chan, Xi Jinping and Jack Ma took third, fourth and fifth places. Oprah Winfrey, Queen Elizabeth II and Hillary Clinton ranked third, fourth and fifth globally. The poll was conducted online. YouGov started out by gathering open-ended nominations from panellists across 35 countries, narrowing that down to a list of 20 men and 20 women. An additional 10 popular local figures were added to individual country lists. The lists were then used to poll each of the 35 countries with two questions. Respondents could pick multiple selections for the first question: "Who do you truly admire?" For the second question, "Who do you most admire? ", they could pick just one.